The Human Individuality Project (HIP): A pilot study to determine whether a new software data tracking tool (Traktion) can successfully analyze, capture, and curate evidence to elucidate if an ABO blood type-specific diet has an effect on individual health outcomes. To study dietary trends and results that are specific to an individual, over the course of that individual’s lifespan. Dietary studies are notoriously difficult to perform. Many potentially confounding factors (ie: exercise, use of drugs and supplements, etc.) can easily skew results, making clear-cut conclusions elusive. Individual variation in a person’s response to nutrition therapy further confounds the problem. One way to circumvent this issue is to develop tools that employ a ‘big data’ approach to the problem, essentially capturing virtually all lifestyle variables in real time, and then performing subsequent correlation studies and longitudinal analysis on the data via structured queries and search heuristics. The Human Individuality Project (HIP) is a research group associated with the Center of Excellence in Generative Medicine at the University of Bridgeport. Our goal is to study the effects of certain types of diets and other naturopathic interventions that are based on simple genetic markers, such as blood groups. We anticipate studying dietary trends and results that are specific to each person enrolled. The purpose of this human research study is to establish an effective method for internet-based data collection in order to ascertain dietary patterns among individuals. 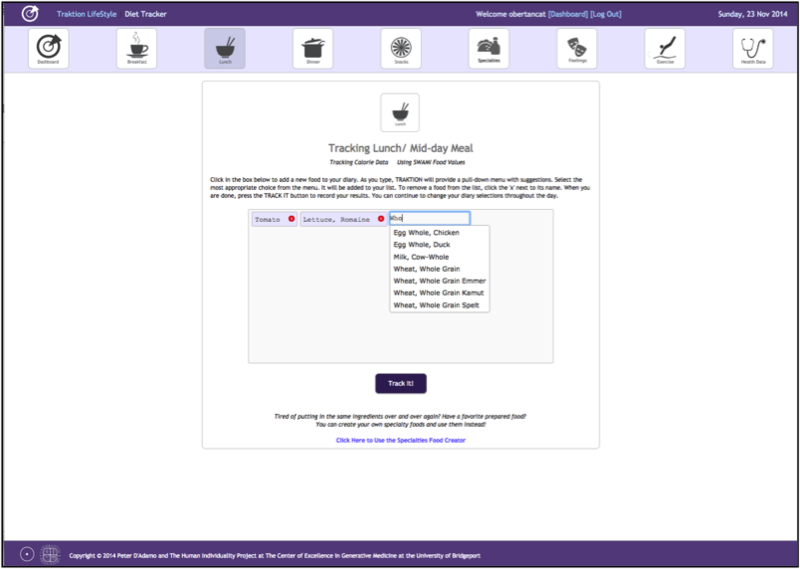 Using own internally developed software (Traktion), participants will gain free access to track daily health measurements over the course of one year in order to help generate dietary trends and measurable health outcomes among sub-cohorts. This innovative health tracking system will be employed by a network of licensed doctors that will also have the ability to access patient health progression over time. Most interestingly, this study will provide novel correlations and explanations between individual diet theories and health outcomes among all participants. Specific cohorts managed by the COEGM and UBCNM that are structured around a particular issue, i.e thyroid pathology, inflammatory bowel disease, obesity, etc. This research uses the Internet as a vehicle for recruiting and/or interacting with subjects on relevant measures regarding their daily diet, lifestyle, and emotional well-being. By using a combination of qualitative and quantitative measures, results generated can improve the evaluation of selected dietary habits and how they function in altering health outcomes over time. Traktion is easy and intuitive to use, as it runs from any internet browser or smart phone. 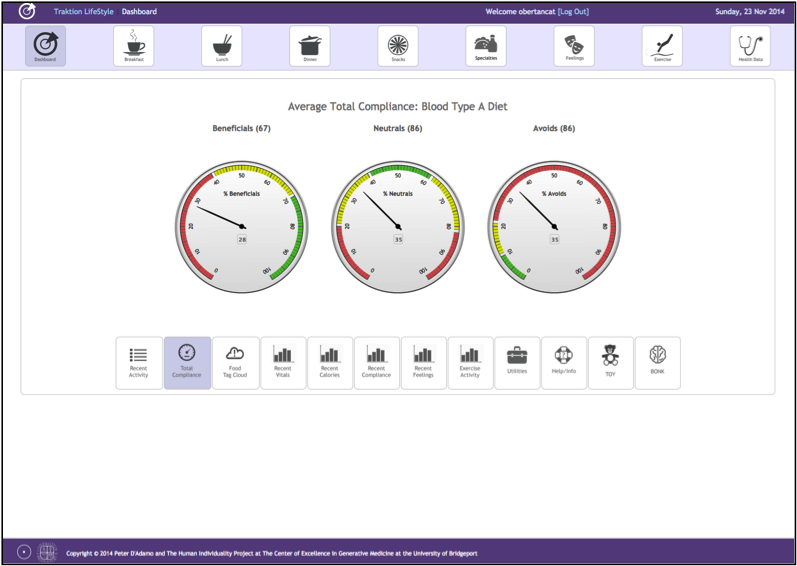 (see Appendix for screen shots) Subject users have the extra reward and incentive of using the Traktion Dashboard, which provides them with direct feedback (ie: charts, graphs, etc.) on just how well they are doing on their diet. Researcher: This is the highest access level. Researchers have access to an admin program (Traktion Bonk). 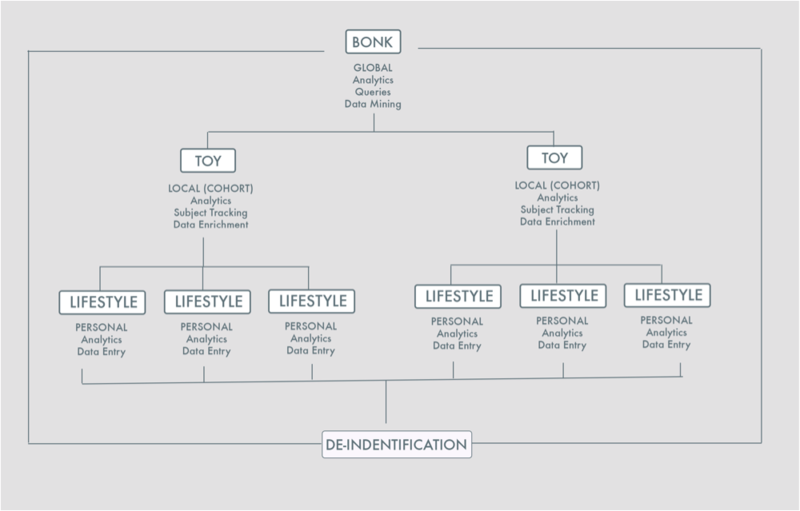 Bonk can perform analytics on the gross data, across all cohorts. The Traktion software is already in beta-testing, and none of the proposed seed grant funding will be used to develop the software, as it is being developed out of the COEGM general fund. After enrolling in the study, if a subject has not entered diet and lifestyle information in over 72 hours, an alert will be sent immediately to the email address associated to their account. If no data has been input for 7 days after the initial email, a follow-up email will be sent. If a subject does not input data for over 30 days, they will be removed from the study pool. Patients will input their diet and lifestyle data daily from their computer or mobile device at their own convenience. This data is expected to be input daily. Diet and lifestyle data include factors related to nutrition, exercise, weight, stress management, blood pressure, fluid intake, mood, etc. For example, specific foods or food components of a meal would be inputted data as well as any daily physical activity. All data entered into the Traktion software database will be encrypted and de-identified to the Researchers. All data will be backed up nightly to a separate secure server. The HAP is the only participant other than the patient who will have identifiable information about their patient participating in the study. Data received through the Traktion software will include, but is not limited to, all foods ingested each day, type and frequency of exercise and fitness habits, supplements ingested, experienced symptoms, side effects from any medications or supplements. The Human Individuality Project, its parent, subsidiaries, affiliates, and respective successors and assigns, may collect and use certain technical information associated with the participants’ use of the Traktion software, including, without limitation, any information provided in connection with any data entry, for the purpose of statistical and clinical analysis that leads to possible publication for peer review. 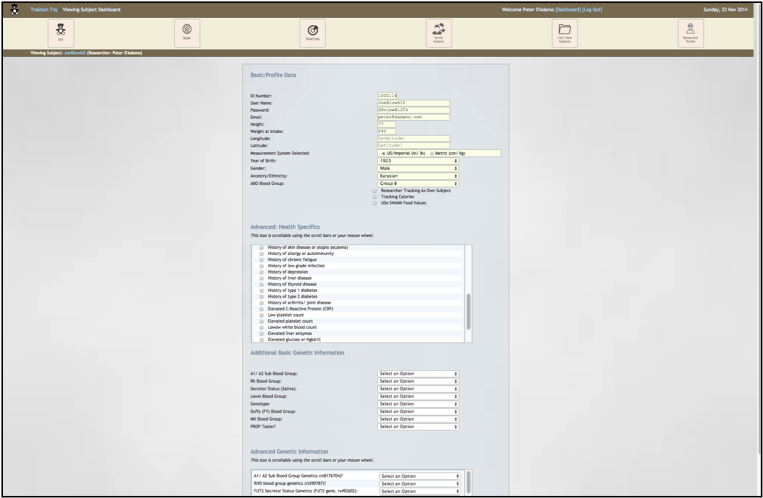 Once logged into the Traktion software, all data is encrypted to ensure patient privacy and health information security. The patient will sign an informed consent to participate in this project. The de-identified data will be analyzed for health trends, disease trends, and treatment modality effectiveness. Enrollment information that has any protected health information (PHI) that may be printed for IT support or software maintenance will be stored in a locked file cabinet in the locked research office at the COEGM. All subject data will be kept confidential according to the HIPAA policies and procedures. All data entered on the Traktion interfaces have an encryption schema designed for and specifically for the use of Traktion. 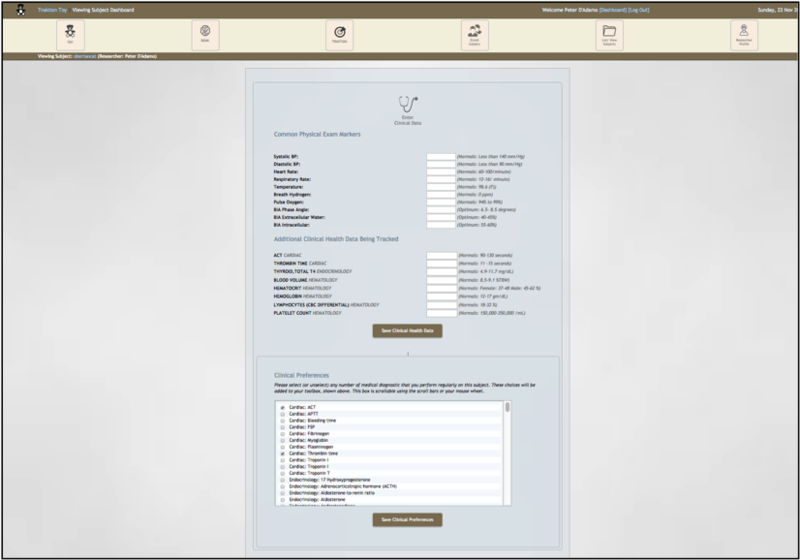 Traktion Lifestyle Interface showing use of ‘autocomplete’ to allow for standardization of input. Traktion Lifestyle Infographic Showing Multi-Axis plot of calories consumed plotted against total calories consumed via exercise and subject BMI. 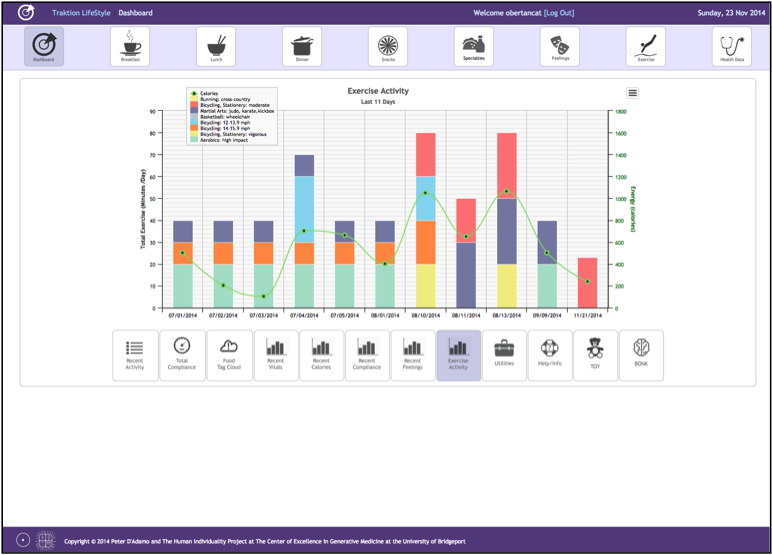 Traktion Lifestyle Interface Showing Use of Intuitive Slider interface to record subject data. 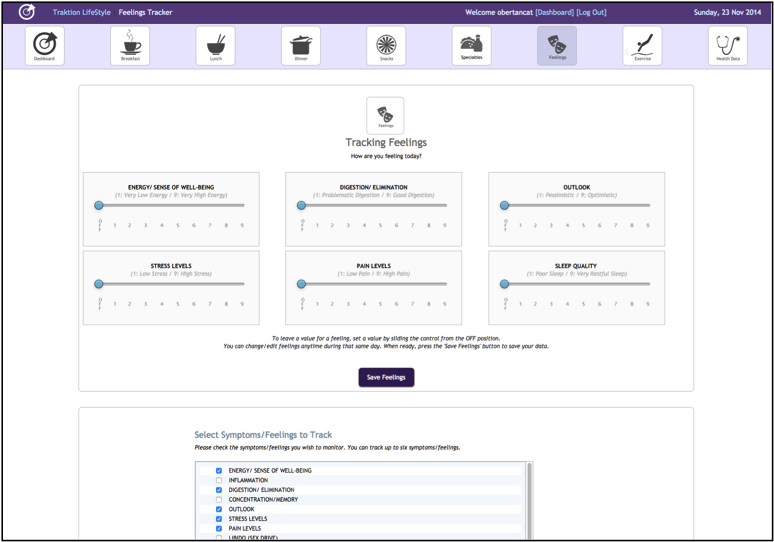 Traktion ‘Toy’ Interface showing possible biomarkers that can be tracked for any subject. Traktion Toy allows the HAP to select biomarkers for tracking from a library of over 200 lab tests.